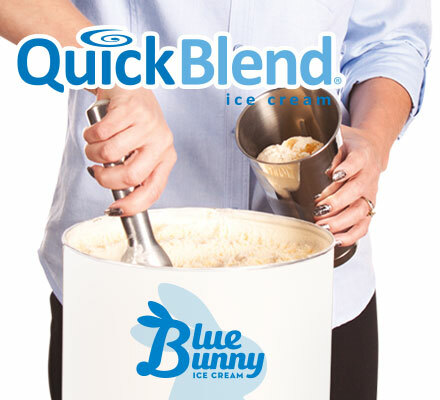 Quick Blend® is real ice cream uniquely formulated to provide a softer product at normal dipping temperatures. Compared to regular ice cream taking 1-2 minutes to blend a shake on a spindle blender, Quick Blend blends in seconds. Ingredients: Milk, Cream, Buttermilk, Whey, Sugar, High Fructose Corn Syrup, Dextrose, Skim Milk, Contains 2% or Less of Natural Flavors (with Vanilla Extract), Propylene Glycol Monoesters, Mono & Diglycerides, Guar Gum, Carob Bean Gum, Carrageenan, Annatto Extract for Color.